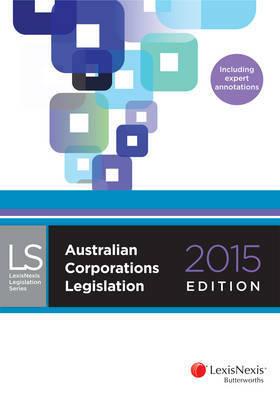 Australian Corporations Legislation 2015 provides a comprehensive single-volume collection of key corporations and related legislation. This edition includes expert annotations to key provisions of the Corporations Act 2001, and extensive editorial and historical notes. This text will give you practical, in-depth assistance and guide you through some of the most complex pieces of Australian legislation. The material includes the latest legislative amendments and is current as at 1 January 2015. Incorporates the following features to assist you in your day-to-day practice: Summarised annotations by Dr Robert Austin, Challis Lecturer at the University of Sydney and Senior Consultant to Minter Ellison and Justice Ashley Black of the New South Wales Supreme Court extracted from the authoritative title Austin & Black's Annotations to the Corporations Act; Overview of 2014 written by Justice Ashley Black highlighting important developments in the area of corporations law over the past 12 months; Reliable indexing of ASIC Class Orders and Regulatory Guides, cross references to relevant sections in the Corporations Act; Shaded tabs at chapter level and shaded annotations to enhance ease-of-use and navigability.